Texas Law for the Social Worker 2016 provides licensed social workers, social work students and professors with the key legal and policy issues specific to the state of Texas today. Issues directly affecting practitioners and their students have been carefully selected statutes, case laws, and official archives of the Attorney General Opinions and Open Records Opinions. No other compilation of such critical, up-to-date material exists for the state of Texas. New up-to-date material belonging to the 81st Legislative Session! Quickly and easily find information that would usually take hours to track down. “This book is a must-have for every social work student in field and every social worker in practice! Staying up-to-date on laws affecting our work is crucial!" The single resource for the legal guidelines shaping the practice of social work in Texas. Each of the editors is a leading authority in the state of Texas on legal issues for social workers and mental health practitioners. 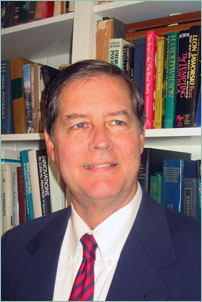 Each is a nationally recognized professor who has received multiple awards for service on the boards of numerous state and national associations. A special project of the National Association of Social Workers/Texas Chapter . 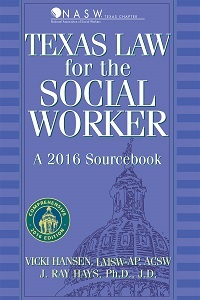 This fourth edition of Texas Law for the Social Worker contains updated information frum the 82nd and 83rd Legislative Sessions, most of which were implemented by November, 2013 or February, 2014. Some noteworthy changes were also implemented in the TSBSWE Rules and Regulations (effective March, 2013), which are now included. In addition, we’ve expanded the collection of Attorney General Opinions that relate to the practice of social work. Regardless of setting, social workers will find information relevant to professional practice: academic professors; social work counselors in public education; workers and agency directors who provide child-care; clinicians doing court-evaluations, adoption studies, or home evaluations; directors and clinicians in training programs, governmental agencies, non-profit organizations, and private practice; any social worker dealing with confidentiality of records, issues regarding reporting of child abuse and/or neglect, social workers doing volunteer work or providing services to victims of human trafficking. Three additional Attorney General Letters and Opinions relevant to the practice of social work have been included: whether parents may use the services of an advocate in dealing with matters of their child’s education (GA-0813); whether a mental health professional is required by chapter 261, Family Code, to report abuse or neglect that occurred during the childhood of a now-adult patient (GA-0944); whether a law enforcement agency is required to furnish information about alleged child abuse or neglect by a person responsible for the child’s care, custody, or welfare to the Department of Family and Protective Services (GA-0879), bringing the total to 11. This section contains selected letters frum the archive of Attorney General Opinions and Open Records Opinions that are relevant to the practice of social work. These opinions are relatively difficult to research because of the way they are indexed on the website of the Texas Attorney General. We hope that this archive will assist practitioners who have questions related to these decisions. For a summary of all the Opinions, see page <?>. Four legal decisions important for the practice of social work are included in their entirety. We have opted to keep the complete presentation while at the same time highlighting the most relevant parts. When you find yourself facing one of these issues, we believe the legal decisions—and the background behind them—will be invaluable to you as a social worker. Jaffee v. Redmond for the first time gave the right of privacy to psychotherapy notes in federal court. Thapar v. Zezulka provides an excellent discussion of the duty to warn and duty to protect doctrine in Texas. We waited over 20 years in Texas to know the status of these duties. The Texas Supreme Court has now given practitioners guidance when a patient threatens another person. In this case, the Texas Supreme Court takes the position that courts should not second-guess the decision by a practitioner to tell law enforcement personnel or medical personnel about the danger presented by a patient. This gives a good deal of discretion to practitioners who are faced with a difficult situation and the decision is certainly pro-therapist. Abrams v. Jones concerns the privacy of information between a therapist, a child client, and the child’s parents and provides a remedy for parents who request but are denied access to a child’s records. Practitioners can draw guidance frum this case about record keeping and the duty to parents and child clients. B.K. vs Cox evaluates the duty to report and derived judicial immunity. Social work is bound by laws and rules under the over-arching NASW Code of Ethics. This social work sourcebook contains the laws and the Code of Ethics. While the law remains unchanged for a minimum of 2 years between legislative sessions, and the NASW Code of Ethics can change, at most, every 3 years, the “rules‿ can change much more frequently. Please go to http://www.dshs.state.tx.us/socialwork/default.shtm regularly to check for updates. For your convenience, in this Fourth edition of the Texas Law for the Social Worker we have included the most recent update to the Social Work Rules and Regulations (as of March 28, 2013). Please see Appendix B (page page <?>), and don’t forget to check the website frequently for addtional updates. For those desiring more in-depth coverage, we have continued to provide relevant Internet links for each of the topics. For instance, the NASW Legal Defense Fund (LDF) has funded in-depth research by the NASW General Counsel on hot legal topics. While not specific to the state of Texas, they are of exceptional quality. Appendix C contains relevant summary information which is free for eligible NASW members. We have again collected for you up-to-date legal information informing the practice of social work in the state of Texas, saving you many long hours of cumbersome research. It is our hope you mark this volume up, refer to it often, and pass along a copy to colleagues. This fourth edition is timely in that many of the updated statutes and modified codes took effect November, 2013 or February, 2014.